Jordan Adams was granted a sixth year of eligibility this season by the NCAA. Photo courtesy of USC Athletics. 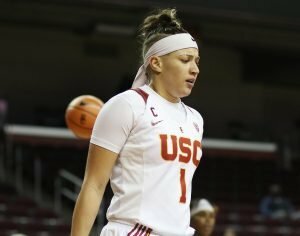 On Senior Day at USC last February, junior center Kristen Simon wore the jersey of her friend Jordan Adams, who had sat for what was to be her last season after tearing her ACL in November. In a few months, Adams will wear No. 1 herself at her last home game, as she returned to the Trojans for a sixth year in 2017-2018 after being granted a medical hardship waiver. And if the early season is any indicator, it could be a emotional day. Adams is picking up where she left off two years ago and has started every game, averaging 30 minutes per outing. 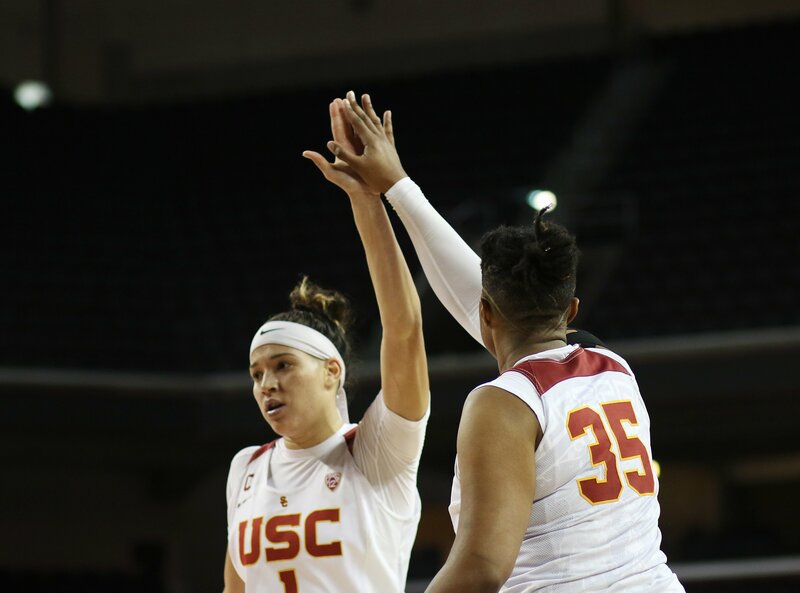 She is the fifth-leading scorer (5.3 points per game) on the team, the third-best rebounder (5.4 per game), is second in assists (3.4 per game) and leads in blocks, with eight so far in helping USC get off to a 10-1 start. 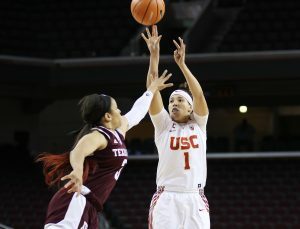 Equally important to the Trojans is what the former Mater Dei High School star brings to the team outside the lines of the court. 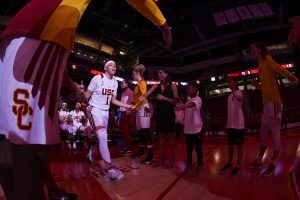 The humor she displays in fan engagement videos at Galen Center is akin to the kind of person she is with her teammates: a warm joke-teller whose infectious personality encourages the younger players and draws the entire team closer together. Simon described Adams as family. Jordan Adams and Kristen Simon work well together on-court, and are friends off of it. Photo by Maria Noble/WomensHoopsWorld. That opinion is shared universally among Adams’ teammates. Simon said Adams’ return boosted the entire team. For Adams, being given a sixth year of eligibility is the culmination of a long, arduous journey through injuries, academic issues and several casts of changing characters. She’s hoping the road will lead to a professional career. “It’s everybody’s dream to play in the WNBA, play professionally, so that’s what I’m going for,” she said. Adams’ start at USC was rocky. Nine games into the season, doctors discovered she had a mass growing in her right knee where she had torn her Posterior Cruciate Ligament in her senior year of high school. She had to have surgery, so was out for the year. Then at the end of the season the University fired coach Michael Cooper and brought in Cynthia Cooper-Dyke to lead the program. Jordan Adams. Photo by Maria Noble/WomensHoopsWorld. 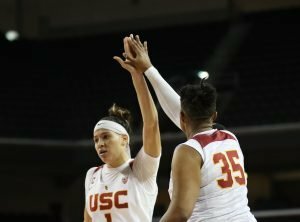 The next year was Adams’ redshirt freshman season, and the Trojans upset Stanford to win the Pac-12 Tournament. 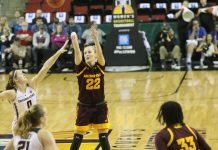 They lost to Colorado in the first round of the same tournament the next year, ending a challenging season that saw five players leave the program. Adams’ junior year in 2015-2016 was cut short when she and guard Brianna Barrett were ruled academically ineligible after 12 games. USC had just broke into the AP top 25 for the first time in many years, but without two starters they went on a losing streak and dropped off of the list for good. Not two weeks into her senior season last fall, Adams tore her ACL at a tournament in Alaska in the first quarter of the first game. She made the most of the year, cheering on her teammates and conducting post-game interviews for team use. It was easy to assume she would call it a career. But Adams couldn’t do that. She applied for a hardship waiver from the NCAA, and got it. She said there were several reasons to return for a sixth year. Adams knew that in order for her playing career to continue, she would need to prove that she was healthy enough to compete at the next level. “Could you imagine me coming off of an ACL tear trying to make a WNBA team?” she said. “I couldn’t,” she added. 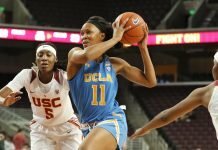 Adams said she also felt incomplete, not having played a full season for two years. And she wanted to do right by USC. The person who inspired Adams the most in her recovery from injury last year was none other than Trojan alumni Jacki Gemelos, who endured five ACL surgeries in her six years with USC. Ironically, it was Gemelos whom Adams looked up to growing up. 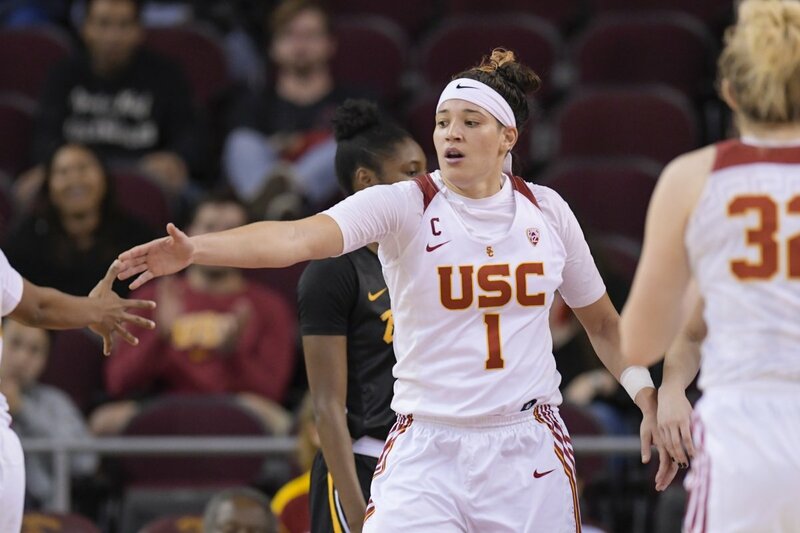 “I remember when I was young I went and saw Jacki play when she was playing for St. Mary’s in high school, and she was actually a huge inspiration for me playing basketball, me being the player I am today, and actually me coming into USC,” Adams said. Jordan Adams is introduced at a recent home game. Photo courtesy of USC Athletics. Her return also coincided with the rehiring of Mark Trakh as the Trojan’s coach after an eight-year absence. Trakh had designs on Adams early in her high school career. “It’s absolutely an honor to be able to play for Mark Trakh,” Adams said. When Adams leaves USC next spring, she’ll have two degrees and many lessons under her belt. She said the hardest one was being ruled academically ineligible, which was the result of both she and Barrett making incorrect citations on final papers. Adams said not being able to play was only part of the pain. Jordan Adams shoots over the defense. Photo by Maria Noble/WomensHoopsWorld. Adams, whose Bachelor’s and Master’s Degrees are both in communications, made the most of sitting out last year, as she did play-by-play and interviews for a few USC games. She said her propensity for speaking made the task easy. She said she might seek a broadcasting career after her playing days are over, and she aims to make that a long time from now. Adams and the Trojans begin Pac-12 play next week at the top of the conference standings. “We’re excited to get going,” she said.